SpamTrakker allows you to easily and reliably filter incoming e-mail. It is an easy to install device that works around the clock to deliver the mail you want, and eliminate the mail you don't want. We configure the SpamTrakker appliance for you, so all you need to do is plug it in. SpamTrakker comes with free & unlimited technical support, free software updates and warranty replacement for the lifetime of your subscription. "The Burlington County Special Services School District is very pleased with "SpamTrakker". From its initial installation to the present, the system has all but totally eliminated bothersome Spam and unwanted email from our network. The dollars saved by minimizing time wasted sorting through numerous emails are immeasurable. I was initially hesitant to give up my existing method of managing mail filtering and spam, but after several months of using SpamTrakker I can truthfully say it is doing an outstanding job. The ease of use, has allowed the entire tech staff the time we need to do the other tasks. The filtering has eliminated many potential problems for our network users and thus the tech staff. Network users usually don't know that it has been freeing them of thousands of unwanted and unnecessary advertisements, but the system assures that teacher and staff time is used for district work, not wasted on dealing with unwanted and unsavory advertising email. Anyone managing a large group of email users will find SpamTrakker to be a 24 hour a day work horse for their network." Most anti-spam software use static techniques to identify a spam e-mail message. This means that it is very easy for spammers to bypass these filters by just making some minor adjustments to their e-mail messages. SpamTrakker uses a different approach called Bayesian technology. Bayesian technology calculates the probability of a message being spam based on its contents. Therefore it can "learn" the difference between spam from good e-mail. Text Analysis - SpamTrakker looks for character styles that spammer's typically use. Header Analysis - SpamTrakker looks for the common tricks that spammers use in order to conceal their identity. So, how does it work? SpamTrakker tags incoming e-mail messages with the details (called hits) of its analysis. Each one of these hits are rated and then added up to give the message a total spam score. It is this total spam score that will determine whether the message gets delivered or deleted. SpamTrakker determines this by checking the total spam score against the threshold that you set for your organization. (i.e. delete all messages containing a spam level of 7 or higher). 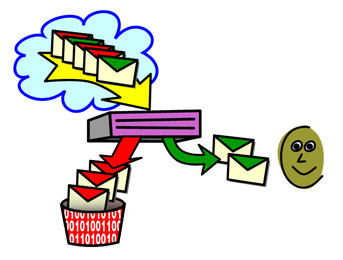 Another great benefit of using SpamTrakker is that if your organization is using a mail client such as Outlook, each user can setup their own rules to direct e-mail messages (that have a lower spam score then your default level) into their own junk mail folders. This can be done by selecting the "specific words in message header" option and typing in the spam score that is tagged to the message header. Users can type this information into their OutLook rules wizard to identify at which spam level they would like to have messages directed to a different mail folder. For SpamTrakker price quotes, use our rate calculator, or call our toll-free number at 1-877-225-0100, or send us an E-mail at info@isboss.com.